William Wordsworth is probably the Lake District’s best known literary figure. He made the area famous with his poetry and his ‘Guide through the District of the Lakes’, published in 1820. At the same time, he decried the many tourists trampling on “his” territory. A native of Cumbria, Wordsworth was born to John Wordsworth and Ann Cookson on April 7, 1770 in Cockermouth. His birthplace (now known as Wordsworth House), a late Georgian style house, sits on the town’s wide, tree-lined main street. It was als the birthplace of Wordsworth’s three brothers (Richard, John, and Christopher) and one sister, Dorothy, who was to live her adult life with William. Wordsworth spent the first 13 years of his life here. His father was an estate agent for Sir James Lowther, owner of the house. William’s mother died when he was 8 and his father when he was 13. Wordsworth attended infant school between 1776 and 1777 in the town of Penrith. He found inspiration at Hawkshead for his early poetry when he attended, from 1779 to 1787, the Old Grammar School here, founded in 1585 by Dr. Edwin Sandsy. The school is now a museum and library. Wordsworth stayed at the home of Ann Tyson, then lodged with his brothers. In 1787 he attended St John’s college in Cambridge. In 1795 an inheritance allowed him to follow his literary aspirations. Following time spent in Dorset (Robert Southey and Samuel Taylor Coleridge became friends here), he toured the Lake District. During the trip he came upon Dove Cottage, a former pub. He moved to the cottage with his sister Dorothy in 1799. 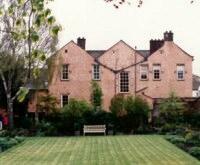 After his marriage in 1802 to Mary Hutchinson, the three of them continued to live here until May 1808. Mary’s hometown was Penrith. 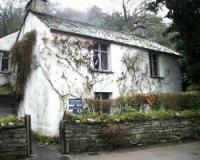 Wordsworth’s best poetry was written while in residence at Dove cottage. Tours are offered of the home, still much as it was during his stay here. In the museum in the grounds is a collection of the letters of William and Dorothy Wordsworth, poetic and prose works of Wordsworth, and Dorothy Wordsworth's journals. Rydal Mount After a brief stint of two years living at Allan Bank in Grasmere followed by a stay at the Old Rectory (across from St Oswald’s church) the family moved to Rydal Mount. In addition to Wordsworth’s wife Mary, sister Dorothy, and his children, his wife’s sister, Sara Hutchinson also lived here. Rydal Mount was the family home from 1813 to 1850, when William died on April 23. His wife continued to live in the home until 1859 when she died. They are buried in the grounds of St Mary’s Church, just down the hill from Rydal Mount and Dora’s field in Grasmere. In the church is the Wordsworth pew where he and his family worshipped for 25 years. William and Mary had three sons and two daughters. Two sons died when the family lived at Allan Bank. His son John served as a vicar of Brigham’s St Bridget church for 40 years. St John the Baptist church in Ulpha was the subject of another poem. In addition to writing, William also held the job of Distributor of Stamps for Westmoreland. Following his being named England’s poet laureate in 1842, he resigned this job. 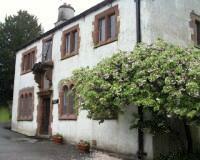 Wordsworth’s brother, Richard, lived in Tirril and once owned the local pub, the Queen’s Head Inn. On Richard’s death his young son, John, inherited it, and Wordsworth helped manage it until John came of age. Wordsworth’s friend, Thomas Wilkinson, lived in the village of Yanwath and Wordsworth helped him in his garden. Wordsworth’s poetry subjects were those of the landscape and people of the Lake District he encountered on his many walks with his sister Dorothy in the area. The themes varied from towns and castles to flowers to countryside features. Bowness-on-Windermere was one town he made popular, while his story about the two “talking” fish in Bowscale Tarn by Mosedale resulted in it becoming a popular Victorian tourist site. Snowdrops came in for their share of poetry as well. A 1000-year-old yew tree in High Lorton caught his imagination. Other yew trees that brouhght out Wordsworth’s literary instincts were those at Seathwaite where he immortalized a grove in the poem ‘Fraternal Four of Borrowdale’. One of the poet’s favourite morning walks was around Esthwaite Water, and he wrote about it in the Prelude. 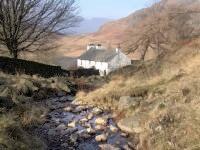 The Duddon valley and its river were other favoured spots, resulting in a series of sonnets about the area. At the head of Little Langdale valley is Little Langdale village and Blea Tarn, the location of Blea Tarn House, featured in another Wordsworth poem. Wordsworth was smitten by the view from Orrest Head in Windermere and wrote about it. He also enjoyed the mountain, Helvellyn, overlooking the village of Wythburn. Crummock Water entranced Wordsworth who stated that “. . .there is scarcely anything finer than the view from a boat in the centre of Crummock-water”. While living at Rydal Mount he walked around Rydal Water by way of Loughrigg Terrace and Red Bank. Wast Water was at first disliked by Wordsworth, then he changed his mind and wrote favourably of it. Another of Wordsworth’s favourite water sites was Loughrigg tarn, which he called a ‘most beautiful example’ of a tarn. Aira Force was the subject of a poem written, in 1842, entitled ‘Airey-Force Valley’. Wordsworth described Dungeon Ghyll Force, a Langdale valley waterfall in ‘The Idle Shepherd-Boys’. Egremont castle is the subject of a local legend, one immortalized by Wordsworth in ‘The Horn of Egremont’. Even Cumbria’s passes came in for poetry by Wordsworth. Kirkstone was one in particular that caught his imagination. His poems about the Lake District have left a legacy of the beauty of the countryside that all continue to enjoy today. Note: Please check opening times and dates before visiting in case of changes. Open: daily, March-Oct, 9.30am-5pm; Nov and Feb, 10am-4pm; except Tue;closed in Dec and Jan.